Lunar IceCube is a small lunar mission designed by Morehead State University and its partners, the Busek Company (Natick MA), NASA Goddard Spaceflight Center (GSFC in Greenbelt MD), and the Catholic University of America (CUA), which will 6U CubeSat prospect for water ice and other lunar volatiles from a low-perigee lunar orbit flying only 100 km above the lunar surface. It was selected in 2015 by NASA's NextSTEP program. The Lunar IceCube will be deployed during lunar trajectory by the SLS (Block 1) iCPS and use an innovative RF Ion engine to achieve lunar capture and the science orbit to allow the team to make systematic measurements of lunar water features. The science goals are to investigate the distribution of water and other volatiles, as a function of time of day, latitude, and regolith composition and mineralogy. IceCube will include a version of the Broadband InfraRed Compact High Resolution Exploration Spectrometer (BIRCHES) instrument, developed by NASA GSFC. BIRCHES is a compact version of the successful volatile-seeking spectrometer instrument on the New Horizons Pluto fly-by mission. Dr. Malphrus is serving as the project principal investigator (PI) with Dr. Pamela Clark (NASA GSFC and CUA) serving as the science principal investigator. One of the enabling technologies that make missions like this possible is the use of a cutting edge ion electric propulsion system. The Lunar IceCube mission will use an ion propulsion system based on Busek’s 3 cm RF ion thruster known as BIT-3. It utilizes a solid iodine propellant and an inductively-coupled plasma system that produces significant thrust even with the low power available to CubeSats. 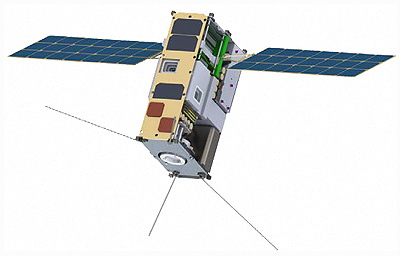 Lunar-IceCube is one of 13 cubesats planned to be carried with the Orion EM1 mission into a heliocentric orbit in cis-lunar space on the maiden flight of the SLS (Block 1) iCPS launch vehicle in 2019.